restaurant, bar and ancillary spaces. The brief was to design a technically advanced and highly adaptable new theatre that would retain the friendliness of the previous building, project the organisation's values of community engagement and local creativity, and encapsulate the collective identity of the people of Liverpool. The new building occupies the same sensitive, historic, city-centre site in Hope Street, immediately adjacent to Liverpool's Catholic cathedral and surrounded by 18th- and 19th-century listed buildings. from the reclaimed bricks of Hope Hall. Defining the main west-facing facade of the building is a large-scale public work of art consisting of 105 moveable metal sunshades, each one carrying a life-sized, water-cut portrait of a contemporary Liverpool resident. Working with Liverpoo photographer Dan Kenyon, the project engaged the city's community in a series of public events, so that the completed building can be read as a collective family snapshot of the population in all its diversity. 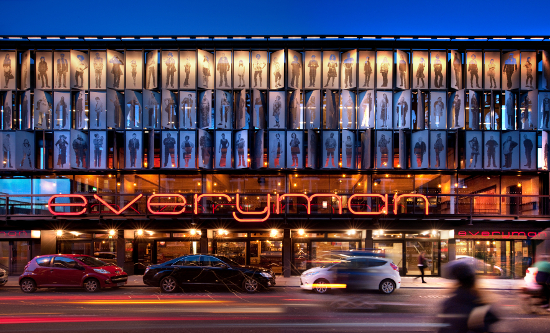 Typographer and artist Jake Tilson created a special font for a new version of the iconic red 'Everyman' sign, while visual artist Antoni Malinowski made a large, painted ceiling piece for the foyer, to complement the internal palette of brickwork, black steel and concrete.